The Snowy Scheme entailed the construction of some 16 dams across the mountains, ranging in size from the huge (Eucumbene, with a capacity of nearly five billion cubic metres) to the tiny (Deep Creek, capacity just five thousand cubic metres). Construction took 20 years, with work on the first (Guthega) starting in 1950, and the last (Talbingo) not completed until 1970. They now form a prominent, perhaps dominant, feature of the mountain landscape, especially seen when flying over the region. They now fill river valleys that were previously home to remote alpine rivers. Mountain forests, fine farming country (e.g. where the Blowering Dam now sits), whole towns (‘Old’ Adaminaby and ‘Old’ Jindabyne) have been inundated to achieve the goals of the Scheme. 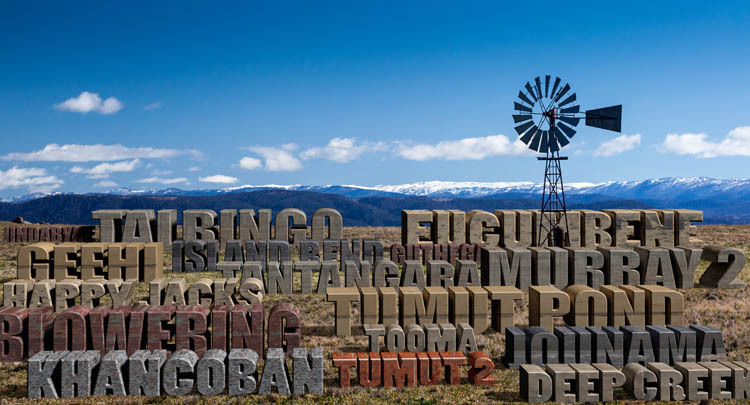 For this image, I’ve put the names of the sixteen onto a hillside looking out to the snow-covered Crackenback and Main Ranges, looking a little like monumental masonry. The windmill suggests an alternative technology for generating power and pumping irrigation waters.